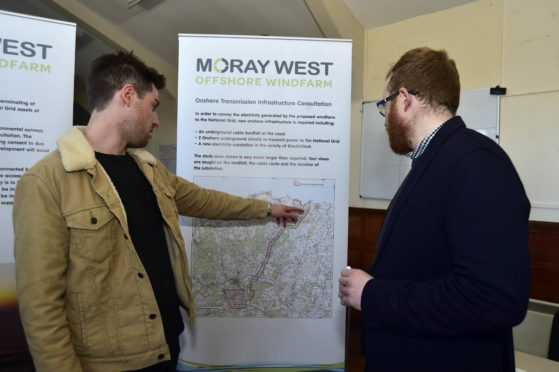 The Moray West proposals are discussed at a consultation event. A controversial offshore windfarm which will provide power for thousands of homes could be rubber-stamped by planners next week. The Moray West offshore windfarm is due to provide energy to 90,000 homes, with up to 85 turbines being positioned off the coast of the Moray Firth. The proposal involves laying almost four miles of cable from popular climbing spot Redhythe Point, just east of Sandend, southwards to Fordyce and then Cotton Hill. Aberdeenshire and Moray councils are due to discuss the scheme on Thursday and its officers have recommended the EDP Renewables project be given planning permission in principle. The offshore element of the proposals, which span both the Aberdeenshire and Moray council areas, falls under Marine Scotland’s jurisdiction and is currently being considered. A report by Aberdeenshire Council’s infrastructure boss Stephen Archer said: “The proposal is consistent with the development plan’s aims of reducing carbon emissions and adapting to climate change. “It also contributes to the Scottish Government’s national planning framework’s aim to move Scotland towards creating a low carbon place. The Redhythe Point cliffs are about half a mile from where EDP now want to bring the cables onshore, but climbers have highlighted potential dangers associated with drilling work and want risk or impact assessment to be carried out. Local climber Stuart Campbell previously raised concerns. He said: “Us climbers aren’t likely, and don’t intend, to stop the whole project – we just want our position given consideration. An onshore substation would also have to be built, at land to the south of Keith, where the Blairhillock site is currently located. There was a groundswell of opposition when the cables were initally earmarked for Sandend Beach, however the developers later re-drafted the plans and changed their location. EDP said it had listened to the concerns of campaigners both with the initial Sandend plans and the revised proposals.